1. To prepare for the Star Wars moving this weekend, my family watched the first three Star Wars movies this week, the ones from the late 1970s. Mr. Pete was really excited about them back in the day; I just kinda went along for the ride, but I don't remember not liking them. With a renewed look, I was surprised how really corny they were! Yet I remember weeping in the second movie over this scene. 2. So the kids and Mr. Pete are excited to see the new movie and I'll go with them, but first I have to read all the spoilers. I am at a point in my life where I want to know what's going to happen in the movies before I go. I want to be able to brace myself for the certain tragedies to come. My kids and certainly Mr. Pete do not understand that, but it makes me feel better. Life has enough unpleasant surprises in it and I can't see the spoilers for that! But if I can lessen the pain of a movie tragedy, I'm going to do it before I go to the theater! 3. Last week on General Hospital, little actress Brooklyn Rae Selzer gave a very moving performance. Her character, Emma, has had to say good bye to her mother twice, and to at least two live-in girlfriends. Last week her father and his paramour decided to break up (her husband is back from the dead - it is a soap opera after all) and Emma was heartbroken. The scene starts around 1:48. When I was around 12, my father cut a visit very short after a confrontation with my grandmother. It remains one of the most painful memories of my childhood. Watching this scene reminds me a little of what that felt like. 3. We did our last day of homeschooling before the break yesterday. 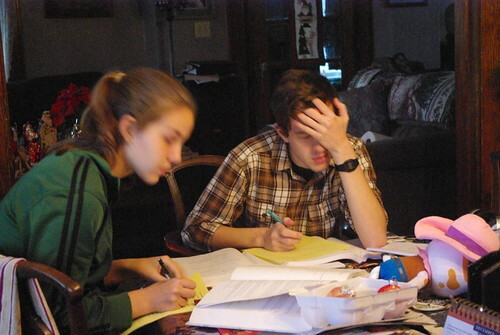 Lest anyone accuse us of slacking off before the holidays- this is what Izzy and Noah looked like yesterday! 4. 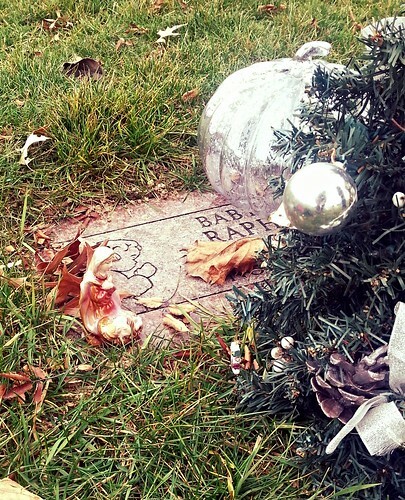 We made it out to the cemetery today to decorate the graves for the baby and mom. It looks so strange to see all of the lovely decorations and no snow!! 5. 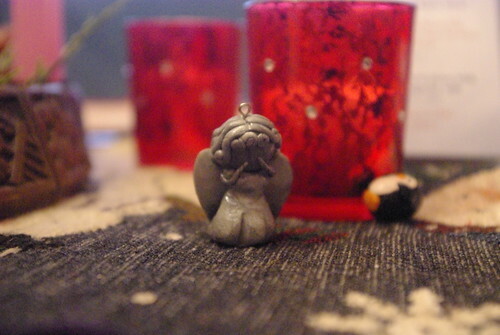 A little weeping angel that Izzy made and gave to her art teacher for Christmas. 6. A busy, busy week ahead! The kids are singing in the Messiah Sunday night, Mr. Pete and I have our last concert on Monday night, then my family is involved musically in three masses on Christmas Eve and Christmas Day! This is why in a musical family, it's best to have the shopping and the wrapping done way before Christmas Week! 7. One of my favorite pieces from this year's concert season. Available on our new CD.